Today, Hartley from Deadly Cool by Gemma Halliday is joining us today. Make sure to check out the giveaway after reading the interview. today. What five words would your best friend, Sam, use to describe you? 2. What first attracted you to Josh DuPont? Josh's name. What's your favorite ice cream flavor? Hands down, Cherry Garcia. The blend of rich chocolate and light cherries is beyond awesome. other), would you be a cheerleader or join the Color Guard? Now that we know a little more about Hartley, it's time for you to win something. 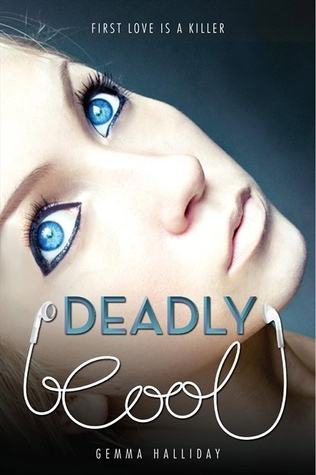 As part of the blog tour Gemma Halliday is giving away several packs of Deadly Cool trading cards! To enter, fill out the form below (comments won't count as entries). Twitter - such a fun way to keep up to date on what's going on in the blogging world and a great way to connect with bloggers, librarians and authors. Plus, it's a fun way to talk about books. But what about the characters? Have you ever wondered what it would be like if some of your favorite characters were on Twitter? What types of things would they tweet about, who would they be twitter friends with? Leenabobeena: Last coat of stain on new bookshelf! Bags packed! Can it be Sat already??? AbbyOhDear: @Leenabobeena So organized! Can't even find my bags. But moms baking up a storm. Be hungry! VivParkerWhite: @Leenabobeena @AbbyOhDear In the Athens airport. Horoscope says good day for journey. Phew. AbbyOhDear: @VivParkerWhite @Leenabobeena Yes, phew! I was all aflutter, waiting to hear. VivParkerWhite: @Leenabobeena @AbbyOhDear Ha. Ha. Speaking of Orin, can’t wait to show our you-know-whats!!! AbbyOhDear: @VivParkerWhite @Leenabobeena Dear god, please tell me you didn’t get a tatt of your astrologer’s face. Leenabobeena: @VivParkerWhite @AbbyOhDear SHHHHH!!!!! No discussion!!!!!! AbbyOhDear: @Leenabobeena @VivParkerWhite You guys remember if there's a fridge in the common room? Or is Frost House too old to even have electricity? Leenabobeena: @VivParkerWhite @AbbyOhDear Very funny. Yes there's a fridge. And microwave. And even indoor plumbing! AbbyOhDear: @Leenabobeena @VivParkerWhite Shocking! I guess we might survive living there. Leenabobeena: @VivParkerWhite @AbbyOhDear Can't believe we finally have singles. Halleluja! 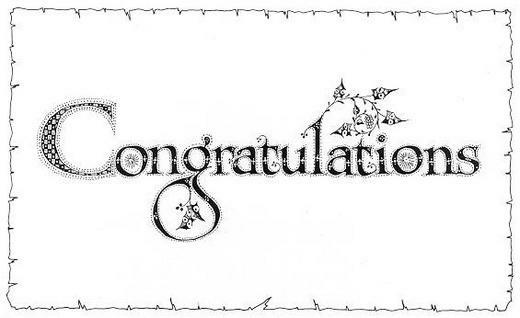 KatetheGreat: @Leenabobeena HEY!!! I can hear you, Leena Thomas! You saying you don't want me back?? KatetheGreat: @Leenabobeena Sure, sure. I won't let the door hit me on the way out. Leenabobeena: @KatetheGreat Don’t worry! We won’t have fun without you, K. Viv, Ab and I will be waiting in Frost when you return! Promise. ThisDavidLazar: @Celestialbeing Hey, you’re online? You okay? Why aren’t you answering phone/texts? Celestialbeing: @ThisDavidLazar Because I’m dead and they only have wifi, not cell service, in heaven. Celestialbeing: @ThisDavidLazar Phone is out of charge. Charger at home. Nurse brought be laptop to use. ThisDavidLazar: @Celestialbeing I’ll bring charger today. You got a delivery. Big box from someplace called Re-evolution? Celestialbeing: @ThisDavidLazar Great. Pigeon skeletons I ordered. Can you put with stuff to go to school? ThisDavidLazar: @Celestialbeing And Barcroft called. You’re living with someone named Leena Thomas in a dorm called Frost House. Celestialbeing: @ThisDavidLazar Leena? Huh. Never heard of Frost. Weird. ThisDavidLazar: @Celestialbeing You know her? This a problem? Celestialbeing: @ThisDavidLazar Living with anyone is a problem. You’ll like Leena. She’s hot. ThisDavidLazar: @Celestialbeing Not my main concern with your roommate. You okay living with her? Celestialbeing: @ThisDavidLazar We were lab partners last year and both survived. I guess we’ll make it through this. Celestialbeing: @ThisDavidLazar Strange I’ve never heard of dorm. 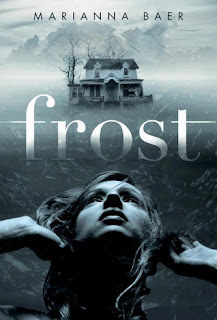 Frost? You’re sure? ThisDavidLazar: @Celestialbeing Yup. Frost. On Highland St.
Celestialbeing: @ThisDavidLazar Still don’t know. Whatever. How bad could it be? A big thanks to Marianna Baer and her cast of characters! This is extremely late, but I wanted to announce the winners of the "It's My Party" giveaway. Charlotte has always felt the need to help people; people she didn't know. It started out as an occasional thing, but now it's a daily occurrence. The pull, the compulsion, knocks the air out of her and forces Charlotte to find the person she is supposed to help. Charlotte tells her boyfriend, Harlin, and best friend Sarah, that she is having asthma attacks. But, Sarah thinks she's psychic and Harlin can't stand the lying, he thinks Chelsea is cheating on him. Charlotte's not sure what they would think if the learned the truth. The she learns what is really causing what she calls "The Need" and what will happen to her. Now, Charlotte must decide of she is going to fight to stay with her friends and family or let everything play out as it's supposed to, no matter how hard it is. 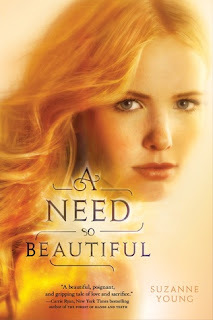 A Need So Beautiful is one of those books where you just have to know what comes next, what's in store for the characters and how they deal with what happens. 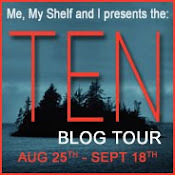 It is very much a character driven book and Ms Young has written all of the characters in such a way that I could see them and hear them as I read. The characters were also very realistic. There were no perfect characters, even Chelsea had her flaws, but that made me like her even more. Another thing that I really liked was that even though Chelsea and Harlin are in a relationship (and how great is it that they are already together when the book starts? ), the majority of love in this book isn't romantic love but love of friends and family. Okay, yes, we do get to see Chelsea and Harlin together and understand what they see in each other, but I liked that Chelsea had friends and a family, albeit a foster family, that cared about her and were present in her life. Ultimately, A Need So Beautiful is about sacrifice. Would you be willing to sacrifice everything in your life for the greater good? This is Chelsea’s dilemma: does she give into the Need and her fate or does she stay with Harlin and her family? And at the same time, there is discussion about faith, not in an in your face way, but it was definitely there. It made me think long and hard about what I would be willing to give up in my life, how my faith colors my choices. A Need So Beautiful offers a different take on paranormal because it felt more like a contemporary story with paranormal details. At heart it is about a girl trying to figure out who she is, so it read very much like a contemporary novel to me. I'm not sure that this review conveys exactly how much I loved this book. I read it in one sitting and was just amazed by it. It made me cry and think and stayed with me long after I read the last page. And that ending! It raised so many questions, while giving Chelsea's story in this book a definitive ending. I, personally, can not wait to read A Want So Wicked.